My oldest daughter, Emily, had a big birthday this past weekend. I find Emily, a tremendously gifted illustrator/graphic designer, difficult to please with my cards. Although I'm sure she would beg to differ. So, I set out to really WOW her for a change. Just how to do that? A challenge I felt I was up to. Emily likes ice cream, so . . . I started with MDS and the stamp brush set, Sweet Scoops. First step was to resize the cute cone to a large, workable size. I then piled on three scoops of the ice cream, topped by a shiny cherry. I added two of the circle punches, which, of course, were enormous, much too large for my little cherry. So I sized and resized, scrunched and moved, until I was happy with the look. I then filled in the little lopsided circle punches with Whisper White cardstock. This is so simple to do in MDS! 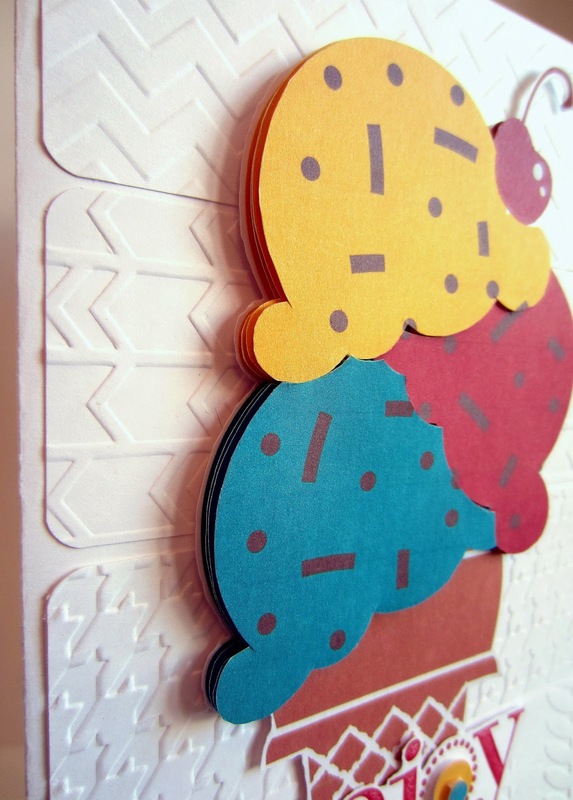 After printing out the ice cream cone on white cardstock four times, I proceeded to cut out all the separate pieces. 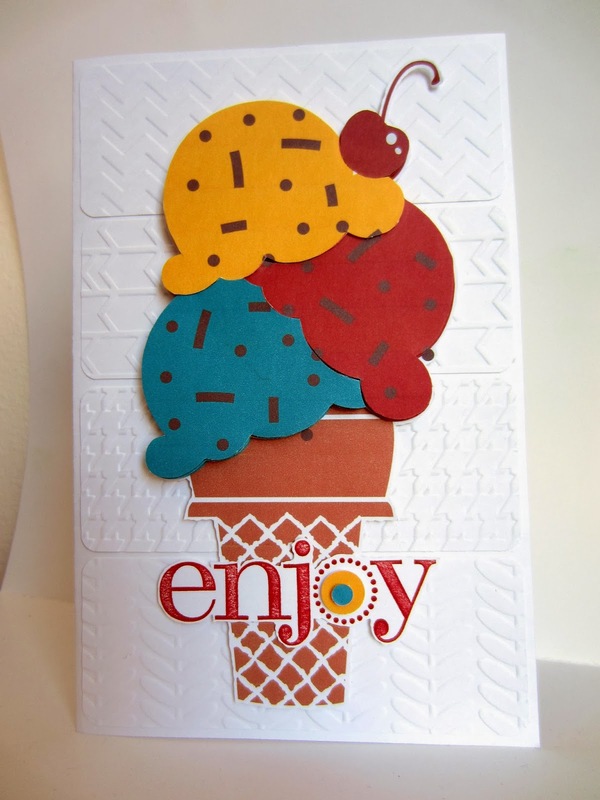 I then lifted the various layers with Stampin' Dimensionals. Well, my ice cream cone was complete, but now what do I do with it? I thought that, for the biggest impact, it should be placed against a white background. But, how boring that was. So I got out four of my Stampin' Up! Embossing Folders, and embossed four pieces of Whisper White cardstock, rounded the corners, and added them to the plain white background. I neglected to mention that the size of this card is 5 1/2" x 8 1/2". Yes, a single sheet of cardstock folded in half. Exactly twice the size of the cards I usually make. So each of the embossed sections was 2" x 5 1/4". 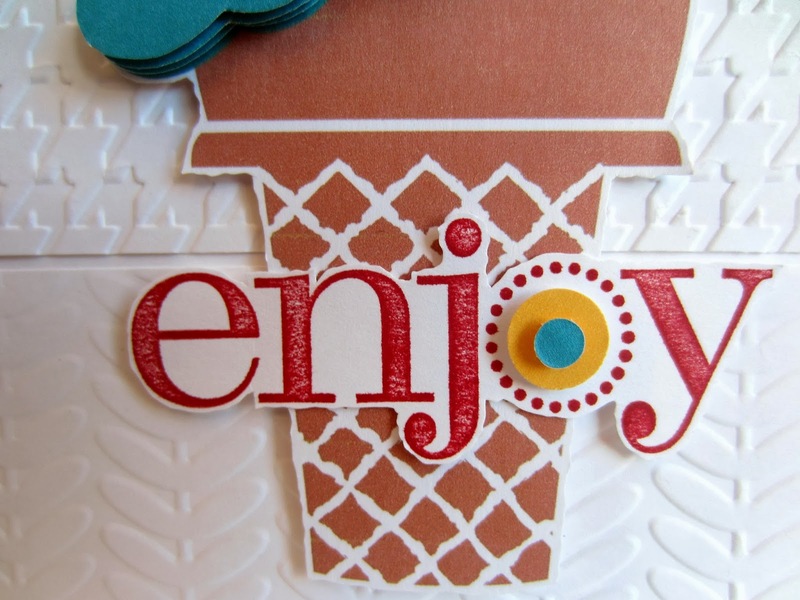 After I was finished attaching the cone to the embossed background, I stamped "enjoy" from an old Stampin' Up! 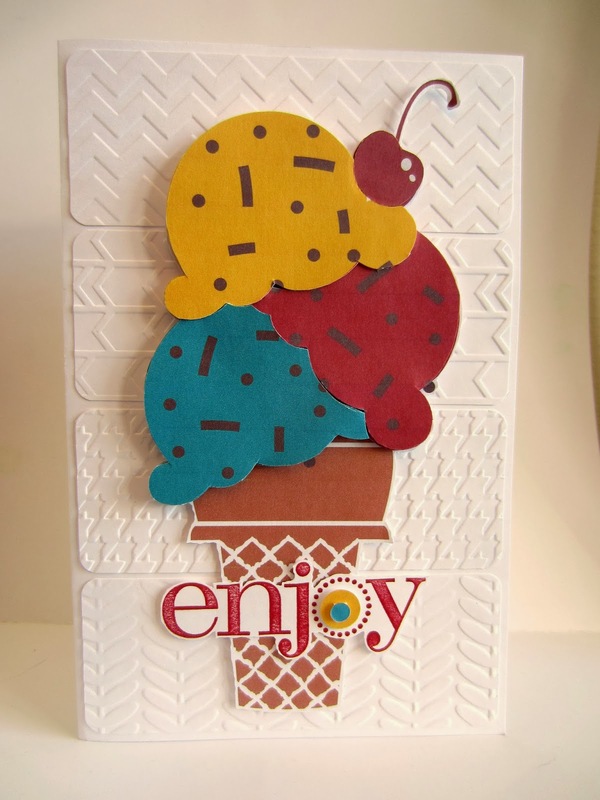 set, adding a 1/2" yellow circle and a blue circle made from a regular paper punch to the center of the "o" to bring the ice cream colors into play once again. I am delighted to report that Emily really liked the card! I feel so fulfilled. Please take a little time to check out Emily's website, www.bluestarink.com. I guarantee you will be positively enchanted! Very sweet! Love the bright colors against the white background. That is such a cute card! Don't you know it's too cold for ice cream?? Oh, my goodness this is cute! It makes me think that summer may not be too terribly far away! :) AND it's graphic designed approved- awesome! ;) Thank you so much for sharing your beautiful work at Treasure Box Tuesday! What a fun card! I love all the details that you included.